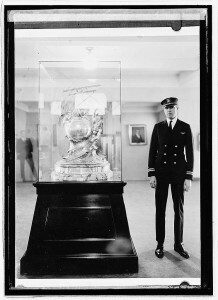 Navy Lieutenant Adolphus W. Gorton standing next to the Curtis Marine Flying Trophy which he won in 1922. On May 26, 1927, navy Lieutenants Adolphus W. Gorton and Clifton Sprague were scheduled to fly from Hillsgrove Airfield in Warwick, Rhode Island, to Washington, D.C.. The plane took off with Gorton at the helm, and when the aircraft was barely 100 feet off the ground it suddenly looped in a circle and struck the top of thirty-foot tree near the end of the field. After glancing off the tree, the aircraft plunged downward into the ground, plowing the turf for thirty-five feet before coming to rest in a heap of wreckage. Lieutenant Sprague escaped with minor injuries, but Gorton suffered the loss of three teeth and his nose was reportedly “torn nearly from his face”. The crash was witnessed by Lieutenant Gorton’s mother who had gone to the airfield to see him off. Gorton later recovered rom his injuries. Lt. Adolphus Worthington Gorton was born in Pawtuxet, Rhode Island, on January 29, 1897, the son of Charles A. Gorton Jr.. After attending Dartmouth College for one year, he entered the American Ambulance Service shortly before the United States entered WWI, and served in France. Seven months later he was operated on for appendicitis and was sent home. After his recovery, he transferred to the naval air service and began pilot training. On October 8, 1922 he won the Curtis Marine Flying Trophy in Detroit, Michigan for attaining an average speed of 112.6 mph. The trophy was sterling silver worth at the time to be $5,000. On August 8, 1923, he broke two aviation speed records in one day flying a U. S. Navy NW-2 over the Delaware River at 177.5 mph, and then 185.5 mph respectively. On July 3, 1929, Gorton successfully “docked” his aircraft while in flight to the airship USS Los Angeles. Gorton died September 28, 1989 in Florida at the age of 92.